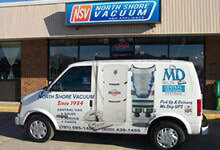 Since 1934 homeowners looking for a new vacuum cleaner or vacuum repair have turned to North Shore Vacuum. With two convenient locations off the Lynnway in Lynn, Mass and on route 114 in Middleton, Mass. From upright to canister to central vacuum systems we carry all the major brands including Miele, Electrolux, Dirt Devil, Hoover and more. Our wide selection makes us the largest and most complete selection of vacuum cleaners in the area. Stop by our showroom in Lynn or Middleton, MA or call us today. Vacuum cleaners go thru a lot a wear and tear and periodically will need repair or belt replacement. Perhaps you need a new hose or need to replace a broken or missing accessory cleaning tool. We stock hundreds of parts for all types of vacuum cleaners by many different manufactures. For vacuum repairs stop by or call any of our locations today! We stock many brands of vacuum cleaner bags for residential, commercial and central vacuums including Miele, Oreck, Hoover, Dirt Devil, Royal and more. Vacuum cleaner bags questions? Call or stop by our showroom in Lynn or Middleton, MA. Our Lynn location call (781) 595-1455. Our Middleton location call (978) 774-1155.